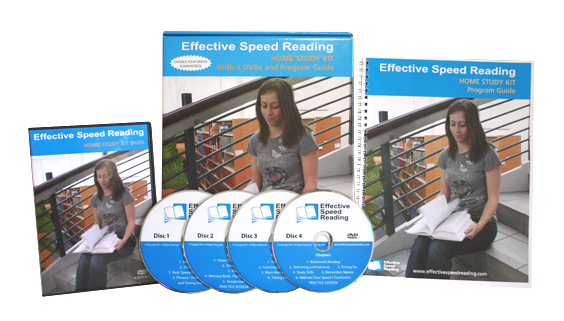 Learn how to Speed Read in the comfort of your own home! Each Home Study Kit contains a set of 4 DVDs, and everything for one person (Grade 7 to Adult) to take the course (program guide, timings and questions, chart, evaluation form, self-addressed envelope). $99.00 + GST with FREE Shipping! Family and friends want to learn too? Additional Learner Packages are available - no need to purchase a second Home Study Kit! If another family member or friend would like to take the course using the same DVDs, Additional Learner Packages are available for only $25 each (plus GST with FREE shipping) (contains program guide, timings and questions, chart, evaluation form, self-addressed envelope). Additional Learner Packages can be purchased now or in the future. Suitable for families, friends, classrooms, businesses, groups. $25.00 + GST with FREE Shipping! Know someone that is in Grade 5 or 6? A Grade 5 and 6 Learner Package is available for their reading level. (contains program guide, timings and questions, chart, evaluation form, self-addressed envelope) (when they reach grade 7 reading level they can advance to the materials provided in the basic Home Study Kit). The Grade 5 and 6 Learner Package is available for $25 each (plus GST with FREE shipping). with little effort and a lot of fun! Experience greater success in school and your career! Comprehension is the whole point of reading. With the “Read Very Well” method, an increase in speed does not mean a drop in comprehension! Comprehension often improves and for some, the improvement is dramatic. Throughout the course, there are several comprehension checks to ensure confidence.